I had tried to post this a couple days ago but I needed to have some settings to my account changed by the moderators. In the meantime I was able to find some information so I post this here for any others who may be seeking the same answer. 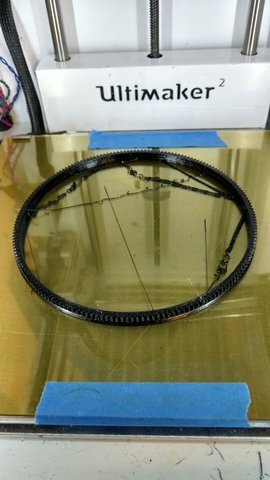 We are having a curious issue with our Ultimaker 2. I can run a couple prints in the morning but after that our printhead will suddenly decide to take a shortcut across the print leaving a trail of extruded material (followed by a few expletives). We suspect the board is overheating as turning the unit off and allowing it to cool completely will restore normal functions but this is cutting into our Joy Of Printing time. What is the connector part number for the J20 fan on the Ultimaker controller board? Looks like a 2.54mm pitch Molex of some sort. I would like to get the correct one as I have a nice 24VDC impeller fan just waiting to get plugged in. I will also be applying heatsinks to the stepper drivers and the processor as well. I have discovered the mating connector is a JST XHP-2 and the contacts are SXH-001T-P0.6. The heatsinks I will be using are an Adafruit 3083 for the processor and t-Global Technology TG-CJ-LI-12-12-10-PF for the stepper drivers. You're correct, the housing is XHP-2, and the contacts are SXH-001T-P06 - for wire gauges 22-28. SXH-002T-P06 for wire gauges 26-30. One thing to note is that crimping those things can be a pain; all the proper crimp tools for JST connectors cost an arm and a leg. Further, your ATMEGA2560 should be good at temperatures up to 85 degrees C, so unless something's very unusual about your setup, it's likely unnecessary. Welcome in here. You already got good info from SyntaxTerror, but here's some more good news. I found this crimping tool (very good quality) from China, where most of this stuff come from these days.. I bought this one, as I built my "UM2" (customised) and can advice this dealer and the tool for the connector used on the printer. I've been working for many years with such tools and say; 16.50 USD for this one is less than 10 % of the price offered from our dealers in Europe or US. Alternatively, since the JST connector is 0.1" pitch, it's perfectly possible to simply remove it and solder in a molex KK series connector (like the one for the temperature sensor etc.) instead. Much more common crimp tools available there. Thank you all for your replies. Crimping isn't a problem, I have the proper tools here at work. It really drives me in-sa-ay-ay-ay-ay-ane. FYI that's ULTEM PEI sheet we are printing on. Works great with PLA and ABS. Cools down and you just lift it off. PETG sticks a bit aggressively. I've had the surface of some printed parts flake off and stick to the ULTEM so I would be leery of that. We've ordered a new controller board set (v2.1.4) and will swap out.